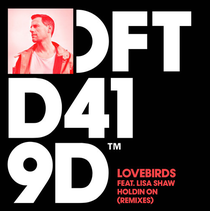 German producer Lovebirds, and his songbird Lisa Shaw, are back with remixes of 'Holdin On', featuring a pair of groove-inducing reworks by Rob Mello and The Shapeshifters. With claps like fluttering wings and rejoicing brass melodies, The Shapeshifters present a four-to-the-floor rendition armed with a tight bassline and effervescent synth chords. With all the possibly makings a summer club track, the track's break sets the tone for a big return that may well shake the tiles off any dancefloor. Opening with a platter of assorted 808 echoes and a robotic bassline, Rob Mello's No Ears Version takes a journey to the trippy side with warm waves of ‘80s inspired synth chords paving the way to Shaw’s vocals. It’s out today on Defected Records, check it out below.